One of the most persistent pests around are fleas. It can seem almost impossible to get rid of them if they hitch a ride home on your pet or even your pants leg. They are also one of the most annoying pests that can take over our homes. These pesky insects make our pets miserable to the point they sometimes can scratch themselves bare. They can make us miserable with little flea bite marks around our ankles, legs, and arms. They can hide in our floorboards, in the walls, in bedding, and other small areas where they create little flea villages. There are of course plenty of chemical options for dealing with fleas, but you really worry about putting chemicals on your pets and around your home where your family can come into contact with them. It seems like a horrible trade-off in getting rid of the pests you need to use chemicals that could be toxic to those that come into contact with it. Thankfully, there is another choice, and that’s essential oils. The good news is here are the best essential oils for getting rid of fleas in your home. Almost regardless of which insect is infesting your home or yard, our top recommended solution is the same. Cedar oil is a safe, non-toxic and all natural solution for killing and repelling most insects. Cedar oil does not harm beneficial insects like bees and butterflies, but it is a contact killer and effective repellent for most insects you’d want to get rid of. See this article to learn more about cedar oil or to see the full range of cedar oil products, click here. Lavender oil is an essential oil that’s most known for people using it to help them sleep, but it has more uses than just at bedtime ​(buy it here)​​​. Lavender oil has been shown in research to be more effective in dealing with fleas and ticks than some other treatment methods. This acts as a repellent in keeping the fleas away from the areas where this essential oil is applied. One thing to keep in mind with this particular essential oil is that it doesn’t kill the fleas, but keeps them away. If you have a problem infestation, this may take longer to get rid of them all. Eucalyptus oil has a very distinct menthol-like scent and can be another good repellent for fleas. In fact, it is sometimes combined with another essential oil, citronella, to deal with fleas. You can even mix this essential oil into a lotion or oil-based spray to use as an outdoor flea repellant. This is another oil that won’t kill the fleas outright, but make them leave the area where it’s applied. Pennyroyal oil is one of the oldest natural remedies for fleas, and this plant is part of the mint family. Pennyroyal oil works best when sprinkled around the home as another flea repellent. One thing to keep in mind with this is that it’s not recommended to be used on your skin or your pet’s fur as it can have rather toxic effects on the body. You can also use the dried herb to assist in keeping fleas away from your home. Citrus essential oils like lemon oil is very popular when it comes to dealing with fleas because it has a very upbeat scent to it. Lemon oil is another great repellent because fleas do not like this scent, so they go elsewhere to find food ​(buy it here)​​​. This is rather popular for pet cat owners, but should not be added to their fur. Instead, you can sprinkle some on the pet’s bedding and in other areas where they lay. This could potentially discolor the fabric, so you may want to spot test it first. You can dilute this oil to be added to human products for keeping fleas away from you. Unlike many on this list, cedar oil is actually toxic to fleas rather than just a repellent. There is a bit of controversy on whether or not it’s safe to put cedar oil on your pets, but it comes down mostly to the source of the cedar oil. Cedar oil comes from cedar trees, and there are several varieties of cedar oil. Some varieties of Cedar have natural substances in them that cats are unable to breakdown as they are missing these enzymes in their system. You’ll want to look for companies that use Texas Red Cedar or Eastern Red Cedar in their essential cedar oils. You’re hard pressed to find a scent that’s pleasing to almost everyone. Mint, especially peppermint smells great and works against fleas ​(buy it here)​​​. You can create a spray that works to repel fleas from your home, and you can even make one to spray on areas of your dog that is irritated from flea bites and scratching as it will help with the itching. You may even enjoy the cooling sensations on those flea bites that make you want to scratch them. One thing you’ll want to keep in mind is that this can be harmful to cats. Basil oil is another example of an essential oil that acts as a repellent towards fleas ​(buy it here)​​​. There are compounds in the basil that make pests like fleas stay away. The best thing about using basil is that you not only can use the oil, but you can use a potted plant to help deter fleas from coming into your home. Then, you can cook with the leaves. Thyme itself is a great remedy as it is effective as a pesticide along with being a fungicide and bactericide ​(buy it here)​​​. Thyme oil will work to kill fleas and can be used in an all-natural flea collar that you can make yourself to keep your dog protected more long-term. Dog owners will find clove ﻿﻿oil a helpful insecticide for your flea problem ​(buy it here)​​​. This works well for adding to the washing machine for washing your dog’s bedding and other items that have fleas in addition to being effective to add a drop or two to your dog’s collar. This is an essential oil that’s not good for cats to come into contact with for any reason. Dog owners here is another one just for your pets as this can be toxic to cats. Rosemary oil is another essential oil that seems perfect for dealing with fleas as it not only helps to repel fleas, it also acts as an antiseptic ​(buy it here)​​​. This is great to use as a wash, especially when your dog’s skin has a noticeable reaction to the flea bites. This will help their skin to start healing while keeping the fleas away from making your dog into another meal. If you’re looking for an interesting time along with fighting fleas, catnip oil may be a good choice for repelling fleas in your home with an essential oil that’s safe for your pets to be around. Catnip is a member of a mint family, and as such, is good for repelling these pests. Plus, cats get more playful and giddy when exposed to it, so that it can be an amusing time for all. Not all essential oils work well for your pets, especially when being applied to the pet’s fur or collar. Be sure to follow the instructions carefully, and if you notice your pet either having a reaction to the smell or the contact of the oil on their fur, it’s a good idea to stop the treatment. No matter which essential oil you use, you’ll also want to do a few other things to help break the flea’s life cycle. The first step is that you’ll want to wash all of your pet’s bedding and anything your pet sleeps on or you’ve noticed fleas on. Washing will help kill all stages of fleas thanks to the hot water and the drying process. Now, you can’t wash big things like your couch, but you can handle them with the next step. The next step that you’ll want to do is to vacuum. Vacuum your carpet, floorboards, couches, chairs, and any other area where fleas and their eggs could be hiding from you. If fleas are a big problem in your yard, you’ll also want to consider some treatment methods for treating your grass. One potential idea is food grade diatomaceous earth as it’s all-natural and kills fleas along with one of the essential oils above, cedar oil. The final step is to not give up too soon. You may think that you’ve gotten them all because you’re not seeing any adult fleas jumping on you or your pets but think again. You should repeat the process of applying the essential oils and these additional steps to make sure that the pest problem is indeed gone rather than just hiding under the surface. Fleas may seem impossible to remove from your home, especially considering that you and your pet go outside, and can have them flocking to you from your lawn. Plus, there’s the lifecycle of the flea to consider where you may get rid of all adult fleas, but then there are the eggs that hatch that cause you to start dealing with this all over again. 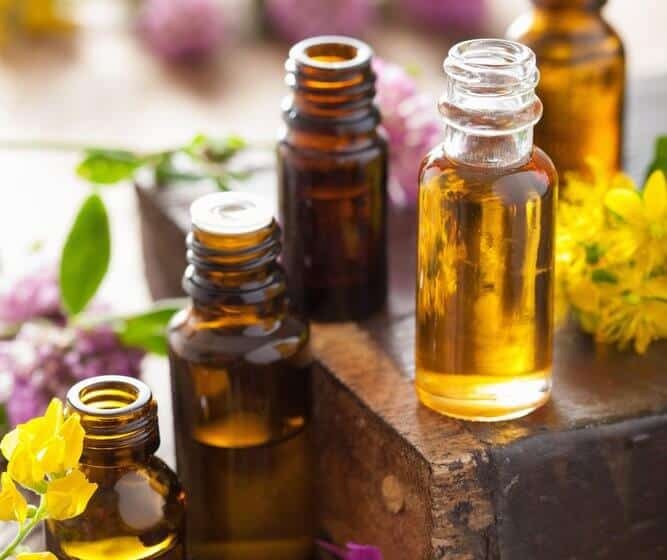 You don’t want to expose your family and pets to toxic chemicals for a long period of time, so it makes perfect sense to turn towards these essential oils for fleas. The nice variety means that you should be able to find an essential oil that smells good to you and is effective in dealing with your flea problem. Do you have a positive experience to share with using essential oils for fleas? Comment below to help others with battling these invasive pests.